If you’ve done 3D printing, you’ve probably at least heard of Tinkercad. This popular CAD package runs in your browser and was rescued from oblivion by Autodesk a few years ago. [Chuck] recently did a video about a new Tinkercad feature: building and simulating virtual Arduino circuits. You can watch it below. There are a variety of components you can add to your design. You’ll find an integrated code editor and a debugger. You can even get to the serial monitor, all in your browser with no actual Arduino hardware. You can also build simple circuits that don’t use an Arduino, although the component selection is somewhat limited. This could be great for teaching Arduino in classrooms or when you want to do some development in a hotel room. The layout is very visual, so if you are accustomed to reading schematics, you may not appreciate the style. In addition, the selection of components is somewhat limited (including only supporting the Arduino UNO, as far as we could tell). So for educational purposes, it is great. For breadboarding your next great Arduino-powered robot, maybe not so much. If you remember Circuits123 (or circuits.io), this is the same underlying technology. They’ve just integrated it with Tinkercad. However, there doesn’t seem to be any real integration between the two other than they are on the same web page now. Perhaps in the future, they’ll let you drop components on the circuit that also show up in the 3D design (or, at least, with sockets or holders for those components). However, having a simulated Arduino with a debugger could come in handy even if you don’t care about the circuit simulations. If you really want to do circuit simulation, it is hard to go wrong with LTSpice. If you really want it to be in your browser, there’s always Falstad. 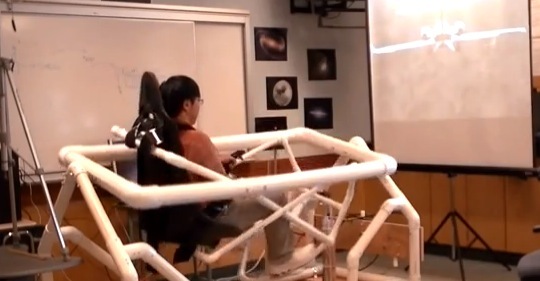 Dominick Lee is a programmer, inventor who created the “LifeBeam Flight Simulator“, a pneumatic-powered dual-axis motion flight simulator using Arduino Duemilanove. After a few months of diligent work and the help of some generous collaborators he was able to mix physics, robotic and aviation into a motion platform that can make full rotations tilting at about 40 degrees. The LifeBeam Flight Simulator is a full setup of equipment that runs simultaneously and collaboratively. The data is first sent from the Graphics or “Gaming PC” through a custom software program that acquires game data. The game data is scaled and converted into specific coordinates for the roll and pitch (X and Y) axis. The program sends out the final signal which is received by an Arduino (Duemilanove). The Arduino has a complex program on it that combines the serial commands and parses certain values to calculate a voltage which is then converted into PWM and sent to a low-pass filter which smoothes the PWM into analog voltage. The analog voltage is connected to a Pneumatic Valve Amplifier which controls the pneumatic cylinders to make the platform move accordingly. After watching the video below you can read the whole documentation on Instructables and make one yourself! You are currently browsing the archives for the simulator category.